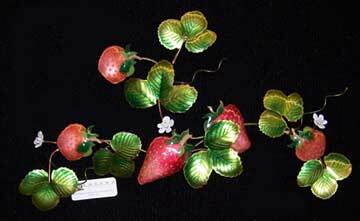 This is Bovano's "Strawberries" This piece was first presented about 2005 as part of the kitchen and fruit series. This series included a peach, apple, plum, pear, grape cluster, pineapple, as well the strawberries. These pieces were usually mounted on a kitchen wall or over the doorway between kitchen and dining room. The Strawberries piece is 8" tall by 14 3/4" wide. It is now fully retired and no longer being created. We have 1 available and ready for immediate shipment.